Sunpenny Publishing Group: Sign up for the Blue Freedom by Sandra Peut read-along! Sign up for the Blue Freedom by Sandra Peut read-along! As we have not had enough interest for the read-along to go ahead yet, the dates above have been cancelled until we have enough participants to make it as enjoyable as possible. Please fill in the form if you would like to take part and we will use your email address to let you know when the event will run. Thank you! 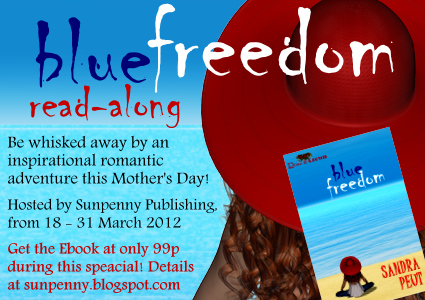 Today I am excited to announce a Sunpenny group read-along of our Rose and Crown inspirational romance Blue Freedom by Sandra Peut for Mother's Day! Bella Whitman is a freelance health and fitness writer with a tragic history. When she is offered a dream opportunity to undertake a writing assignment which will take her on a journey across the South Pacific islands, she grabs it, despite her misgivings about the arrogant but handsome editor in charge of the magazine, Ethan Gray - and Jay Hinkley, the contract photographer Ethan has hired to travel with her. Despite a rocky start, Bella finds herself being drawn to Jay as they work and travel through the islands. But can this relationship develop into more than a friendship, when he already has a woman in his life? And with a dangerous hitman trailing their every move, can Bella and Jay finish their assignment - despite the shadowy motives of their employer Ethan - and survive a deadly rendezvous with a Thai drug consortium in a nail-biting climax? Through this fast-paced adventure, Bella is able to find healing from past pain and discover emotional and spiritual freedom. A thrilling mystery of exciting anticipation, witty antics and laughs, with heart-felt truths all in a 'what happens next' plot. Simply and elegantly written - your imagination is caught in the perfect 'Pacific' drama that just keeps getting better to the very end. Sandra Peut’s Blue Freedom is a riveting, fast-paced novel that you will not want to put down. The story chronicles free-lance writer, Bella Whitman’s unwitting entanglement with an international drug deal, and her colleague, Jay Hinkley’s sudden need to be more than a photographer, when Bella’s life is in danger. Action, intrigue and romance, Blue Freedom is a novel that has it all. -- Meredith Resce, author of ‘The Heart of Green Valley’ series, and ‘For All Time’. Thank you to everyone who signs up for the read-along- we hope you will have lots of fun discussing Blue Freedom with us! Skipping Chocolate for Lent? How’s that Going for You? Have you seen our new website? It's Read An E-Book Week! Happy World Book Day 2012! Followers - thank you for following! All content copyright Sunpenny Publishing Limited. Simple theme. Powered by Blogger.